Derges hails from a school of British photographers formed in the 1980s committed to using historical processes and materials to create an unmediated photographic experience. Adam Fuss, whose work is also on view, belongs to this group. In her groundbreaking series The Observer and the Observed (1992), represented here, she flips the function of the camera’s one point perspective on its head by blurring the central subject—the self portrait—in favor of highlighting sharply-rendered water droplets, each containing body parts. Close viewing then does not always cough up a metaphorical truth. This work duplicates a 19th century scientific experiment. Using a high-speed strobe, she creates a standing wave from a stream of water which appears as a series of drops suspended in space. 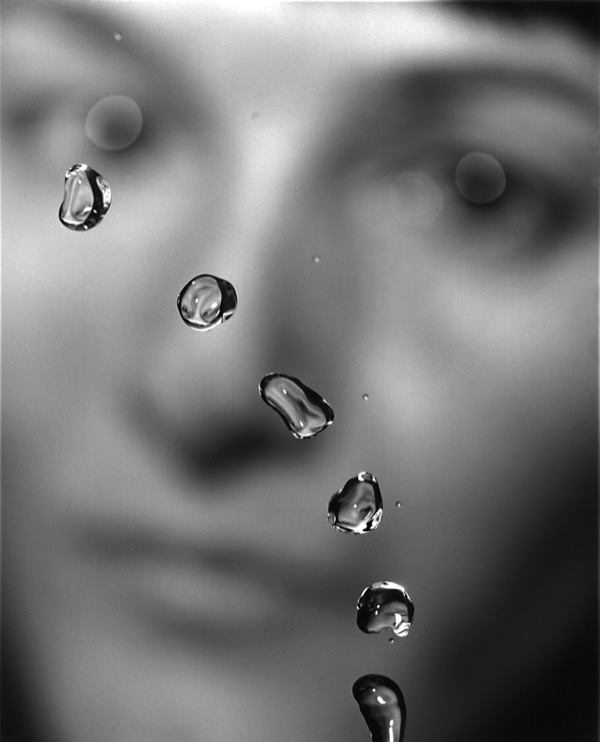 Behind the drops is an out-of-focus image of the artist's face, but within each drop she appears reversed. Close up, the viewer sees the inverted image with much greater clarity, refracted as it is through the lens of each watery bead.